It's bound to happen. The zombie apocalypse. This film is about 4 survivors finding their way to a zombie-free amusement park in Los Angeles from Texas. Along the way they kill LOTS of zombies, run into a celebrity and actually tell a pretty endearing story. 2009 has been the year of the "serious" genre pictures. Sure, we had Michael Bay's asplosion fest with Transformers and some rather disappointing fare like Surrogates. 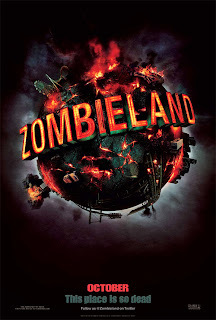 But Star Trek, Inglouious Basterds, and District 9 have brought the genre picture to the foreground and Zombieland continues that tradition. In short, this is a fantastic year to be a nerd. Zombieland opens strong and finishes even stronger. The story is told from the perspective of Columbus (all characters go by their hometown instead of their actual names) played by the always charming Jesse Eisenberg. He sets out his list of rules for surviving in Z-land and that's the sequence that sets the precedent for the rest of the film. This opening sequence is chock-full of zombie goodness, wit and style. Followed by a fantastic Watchmen-esque opening credits sequence and the introduction of Woody Harrellson's awesome Tallahassee Zombieland knows how to keep its audience going. The other interesting thing about Zombieland is how much heart this film really has. The characters are all pretty engaging and a couple of them actually have heartbreaking stories. And, you actually CARE about them. Most zombie films use their main characters simply as zombie killers and well, nothing more. Or their stories are so cookie cutter one wishes there were less people and more zombies. Zombieland brings these characters together as more than just a group of dull losers that are there simply to give the film a story. They really are a family. Add to the mix one of the greatest celebrity cameos in the history of cinema and Zombieland is a blast and a half of zombie destruction! I thought that this was a perfect review. I agree with you wholeheartedly. After having my hopes up for surrogates i was a little nervous about hearing all the good reviews about this movie and wasn't sure what to expect. I was blown away, probably the best new movie i've seen if not the best zombie movie i've seen.